Although Geoffrey of Monmouth's History of the Kings of Britain is more myth than history, it records important pieces of British myth and legend. In the following excerpts we see one of the earliest discussions of the Welsh giant Gogmagog, whose name may refer to the Biblical names Gog and Magog or a corruption of the name of the Welsh hero Madoc. The second excerpt discusses the role of the ancient giants in building Stonehenge, part of a widespread ancient effort to ascribe to the giants the construction of anything unusually large or complex. 16. The island was then called Albion, and inhabited by none but a few giants. Notwithstanding this, the pleasant situation of the places, the plenty of rivers abounding with fish, and the engaging prospect of its woods, made Brutus and his company very desirous to fix their habitation in it. They therefore passed through all the provinces, forced the giants to fly into the caves of the mountains, and divided the country among them according to the directions of their commander. After this they began to till the ground and build houses, so that in a little time the country looked like a place that had been long inhabited. At last Brutus called the island after his own name Britain, and his companions Britons; for by these means he desired to perpetuate the memory of his name. From whence afterwards the language of the nation, which at first bore the name of Trojan, or rough Greek, was called British. But Corineus, in imitation of his leader, called that part of the island which fell to his share, Corinea, and his people Corineans, after his name; and though he had his choice of the provinces before all the rest, yet he preferred this country, which is called in Latin Cornubia, either from its being in the shape of a horn (in Latin cornu), or from the corruption of the said name. For it was a diversion to him to encounter the said giants, which were in greater numbers there than in all the other provinces that fell to the share of his companions. Among the rest was one detestable monster, named Goëmagot, in stature twelve cubits, and of such prodigious strength that at one shake he pulled up an oak as if it had been a hazel wand. On a certain day, when Brutus was holding a solemn festival to the gods, in the port where they at first landed, this giant with twenty more of his companions came in upon the Britons, among whom he made a dreadful slaughter. But the Britons at last assembling together in a body, put them to the rout, and killed them every one but Goëmagot. Brutus had given orders to have him preserved alive, out of a desire to see a combat between him and Corineus, who took a great pleasure in such encounters. Corineus, overjoyed at this, prepared himself, and throwing aside his arms, challenged him to wrestle with him. At the beginning of the encounter, Corineus and the giant, standing, front to front, held each other strongly in their arms, and panted aloud for breath, but Goëmagot presently grasping Corineus with all his might, broke three of his ribs, two on his right side and one on his left. At which Corineus, highly enraged, roused up his whole strength, and snatching him upon his shoulders, ran with him, as fast as the weight would allow him, to the next shore, and there getting upon the top of a high rock, hurled down the savage monster into the sea; where falling on the sides of craggy rocks, he was torn to pieces, and coloured the waves with his blood. The place where he fell, taking its name from the giant's fall, is called Lam Goëmagot, that is, Goëmagot's Leap, to this day. 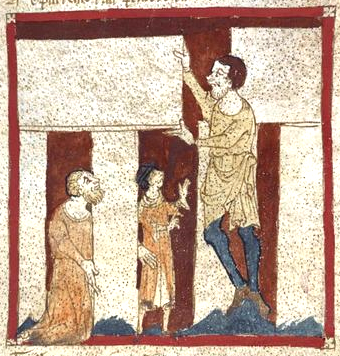 A giant builds Stonehenge, Egerton MS 3028, c. 1325-1350 CE.